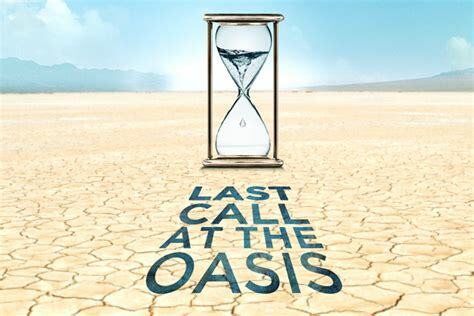 This is a wide ranging documentary about the global freshwater crisis. It focuses mainly on the US, which has the largest water footprint per capital. However it also briefly addresses even more severe water issues in Australia, the Middle East and India. The film addresses numerous issues contributing to the shortage of fresh water – climate change, causing more frequent droughts and declining snow backs (an important source of fresh water), the rapid depletion of groundwater (many US aquifers are predicted to be totally gone in 60 years), and the contamination of remaining freshwater by unregulated toxic chemical discharge, factory farm waste and fracking wastewater. As usual the federal regulatory agencies (EPA, FDA, USDA) come off looking really badly in contrast to their European counterparts. It also comes across loud and clear that poor Americans suffer the most from contaminated drinking water – especially when government looks the other way. The film also highlights how spoiled and entitled many Americans are in their attitudes towards water conservation. Unfortunately there are no easy solutions to contaminated drinking water. Drinking bottled water isn’t one of them. As the filmmakers point out, bottled water is even more poorly regulated than tap water. Neither is desalinization, which is extremely polluting, both in terms of CO2 pollution and a nasty brine residue that’s nearly as harmful as nuclear waste to human health and the environment. It appears that the cheapest and most environmentally friendly solution for desert areas like the Southwest and Southern California is one adopted by the city of Singapore: recycling purified waste (sewage) water. Most Americans resist this approach due to the “yuck factor.” Reportedly Los Angeles is on track to begin waste water recycling by 2019. The mass production of America’s food comes with a hefty price. Find out the environmental, animal, and human impact of raising over 99 percent of US farm animals in factory farms in this infographic,”The Truth About Factory Farms.” Visit our infographic page for the high-res version. Is It Time to Bring Down Civilization? 1. The planet and the human species can only be saved by bringing down civilization. 2. This can only be accomplished by violent means. Like a philosopher, Jensen builds his case on 20 basic premises listed at the beginning of both volumes (see below). By definition, a premise is mutually agreed assumption (as opposed to a statement of fact) that is used to rationally derive a set of conclusions. In other words, if someone rejects your premises, they will also disagree with conclusions based on these premises. I myself agree with all but premise 9 and 12. Ten years ago, it was believed that the loss of fossil fuel based industrial agriculture would result in a big drop in population. However more recent research shows that permaculture and biointensive agriculture produce higher crop yields than factory farming. I also believe there is a vast difference between rich and poor people, both in terms of lived experience and power. In Volume 1, Jensen traces the rise of cities, which by necessity steal resources from distant regions and eventually denude the entire landscape of these resources. After making the case that the corporate elite are voraciously consuming an ever increasing amount of energy, land, water and other resources, Jensen reminds us that we live on a finite planet. He then argues that corporations will most likely continue this greedy consumption until everything is used up – or until we stop them. Volume 2, which is less structured and more informal, encapsulates many of Jensen’s experiences with the environmental movement and dogmatic “nonviolent” resistance advocates. Given the CIA’s heavy infiltration of both domestic and foreign non-violent resistance campaigns (see How the CIA Promotes Nonviolence), these chapters resonated strongly with my own experiences. Other than general talk about blowing up dams and cellphone towers, Jensen is deliberately (and in my view wisely) vague about the exact form of violence he’s proposing. 1. Civilization can never be sustainable, especially industrial civilization. 2. Traditional (ie indigenous) communities do not give up or sell their resources unless these communities are destroyed. 3. Industrial civilization would quickly collapse without its reliance on widespread violence. 4. Civilization is based on a clearly defined – violence by those at the top of the hierarchy against those at the bottom is often invisible. 5. The property of those at the top of the hierarchy is more valuable than that of those at the bottom. 6. Civilization isn’t redeemable – it will never voluntarily undergo sane transformation. 7. The longer we wait to bring down civilization, the messier the ultimate crash will be. 8. The needs of the natural world are more important than the needs of the economic system. 9. Some day there will be far fewer human beings on the planet than there are today. 10. The culture as a whole and most of its members are insane. The culture is driven by a death urge, an urge to destroy life. 11. From the beginning this culture – civilization – has been a culture of occupation. 12. There are no rich people and no poor people. The rich delusionally believe they own all the land and the police enforce these delusions. The poor buy into these delusions almost as completely as the rich. 13. Those in power rise by force. The sooner we accept this, the sooner we can decide how best to resist them. 14. From birth on, we’re acculturated to hate life, the natural world, women and children, to fear our bodies and to hate ourselves. 15. Love doesn’t imply passivism. 16. The material world is primary (to the spiritual world). Real world actions have real world consequences. 17. It’s a mistake (or more likely denial) to base our decisions on whether the actions stemming from them will or won’t frighten fence sitters or the mass of Americans. 18. Our current sense of self is no more sustainable than our current use of energy or technology. 19. This culture’s main problem is the belief that controlling and abusing the natural world is justifiable. 20. Within this culture economics – not community well being, not morals, not ethic, not justices, not life itself – drives social decisions. 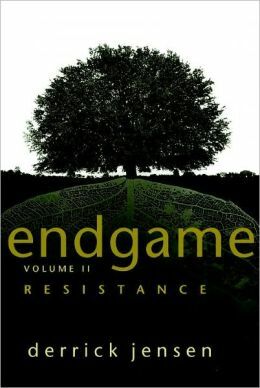 The 2011 documentary EndCiv: Resist or Die is loosely based on Endgame. The Problem with Chicken is a PBS Frontline documentary about a year-long Salmonella Heidelberg epidemic in 2012 that infected more than 600 people in 29 states. Salmonella Heidelberg is a particularly virulent form of salmonella that is increasingly prevalent in factory farmed chicken, as well as increasingly antibiotic resistant. Salmonella Heidelberg infection frequently results in hospitalization and occasionally death. The film examines a hopelessly corrupt regulatory system in which the USDA* inspectors test whole birds, but not chicken pieces (the most common source of salmonella infections) and in which the USDA couldn’t compel Foster Farms to recall their contaminated chickens until they located an an unopened pack of Foster Farms chicken with the specific strain of Salmonella Heidelberg that had infected a specific chicken. This obscure legal technicality meant that despite clear DNA evidence identifying Foster Farms as the source of contamination, an outbreak that could have been stemmed in a few weeks went on a full year and officially sickened 634 people. The Problem with Chicken also explodes the chicken lobby myth that chicken-related infections can be prevented by proper cooking and handling of chicken. Studies show that thorough cooking doesn’t kill either salmonella or campylobacter, another human pathogen commonly carried by chicken. 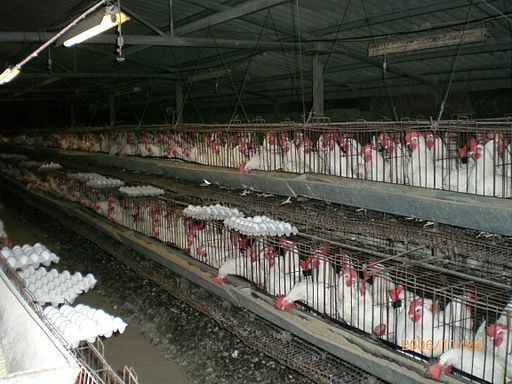 The main shortcoming of this documentary is its failure to examine why potentially deadly pathogens are increasing in factory farmed chicken: namely the process in which battery chicken are raised in a cesspool of feces in tightly packed cages and continually fed antibiotics (the main source of increasing antibiotic resistance). See Food Inc. Surely these are the practices that need to be banned by regulation. It’s ridiculous to expect that a few hundred USDA inspectors are going to protect us from food-borne illnesses by spot checking hundreds of thousands of turkeys and chickens for pathogenic organisms. *The US Department of Agriculture is the federal agency responsible for guaranteeing food safety. While the federal government remains hopelessly mired in endless wars and draconian trade treaties like TPPA, TTIP and TISA, at the local level community rights activists are systematically reclaiming the right to govern themselves. Over the past 20 years, hundreds of communities have passed local ordinances banning factory farms, toxic sludge, GMOs, fracking, toxic contamination, depletion of local aquifers and other corporate abuses. Some activists have chosen to battle corporate infringement on their communities by establishing their legal right to home rule. At present, 31 states have constitutional amendments that grant cities, municipalities and/or counties the ability to pass laws to govern themselves (so long as they obey the state and federal constitution). The number is constantly growing, with Nevada becoming a home rule state in July 2015. Most non-home rule states use Dillon’s rule to determine the bounds of a local municipality’s legal authority. Dillon’s rule, written by a federal judge in 1968, states that municipalities only have powers expressly granted to them by state government. In California, Mendocino activists are presently circulating a petition to become a charter county. They must collect 4,000 signatures by January 15 to place a citizens initiative granting their county home rule on the November 2016 ballot. Mendocino wants to join fourteen other California charter counties (Alameda, Butte, El Dorado, Fresno, Los Angeles, Orange, Placer, Sacramento, San Bernardino, San Diego, San Francisco, San Mateo, Santa Clara, Tehama). Acts passed by charter counties are the equivalent of laws passed by the Californian legislative. The California constitution even allows home rule counties to pre-empt state law where significant local interest is served. In contrast, ordinances passed by general or non-charter counties are subordinate to the will of the state legislature. Other California charter counties are using home rule to ban fracking and to keep toxic pesticides out of their wells and surface water. As a charter county, Mendocino would also have the power to create a publicly owned bank like the Bank of North Dakota. The charter initiative is a project of the Community Rights Network of Mendocino Network. In 2014, they successfully lobbied the board of supervisors to pass an ordinance that makes it illegal to engage in fracking in Mendocino County. By becoming a charter county, this ordinance assumes the force of state law. This makes it much harder for the oil and gas industry to overturn in court. The four part video below features anti-globalization activist Vendana Shiva speaking about Gandhi’s campaign for Indian home rule (if you click on the first link, parts 2-4 will play automatically when the previous segment finishes). Food Inc is a 2008 classic only recently available for free on-line screening. Featuring investigative journalist Eric Schlosser and food activist Michael Pollan, it’s the first and (in my view) the best expose of factory farming. This film mainly focuses on the deplorable disease-inducing conditions of battery chicken houses and industrial feedlots and slaughterhouses. However it also draws attention to the current epidemic of food borne illness, diabetes and heart disease; the corporate capture of regulatory agencies meant to protect us; the federal subsidies that make junk food cheaper than fresh fruits and vegetables; Monsanto’s vicious treatment of farmers who choose not to grow GMO crops and the food disparagement and anti-labeling laws meant to keep consumer sin the dark about where their food comes from. The cinematography captures horrific scenes of factory chicken houses where chickens live on top of each other in total darkness and feed lots in which cows spend their whole life knee-deep in manure. The latter cakes their hides and inevitably contaminates carcasses at the slaughterhouse. The films draws interesting parallels between the abysmal treatment of animals and workers in the industrial food chain. Food executives argue that animal suffering is inconsequential because they’ll all be dead soon. They also regard immigrant workers as expendable because there are so many of them. The filmmakers catch meat processors deliberately recruiting illegal laborers in Mexican villages devastated by the North American Free Trade Act (NAFTA). Employers are never prosecuted for these activities. Only immigrant workers are targeted. This documentary is about Australian Bill Mollison, the father of the international permaculture movement. The title, which is ironic, refers to air drops of food aid (by the industrial north) to compensate the third world for destroying their food production systems. Mollison defines permaculture as a design system for housing, energy, water management, waste recycling and food production that follows nature’s engineering principles. Permaculture purposely mimics natural systems to create a permanent, sustainable culture for human beings. In addition to exploring Mollison’s personal history and philosophy, Grave Danger of Falling Food offers a good introduction to permaculture design and the concept of permaculture zones. Despite Mollison’s lifelong concerns about the environmental devastation wreaked by industrial agriculture and multinational extractive industries, he has reservations about the war mentality of the environmental movement. Instead of “fighting” to save rain forests and endangered species, he thinks it makes more sense to get people as many people as possible to adopt lifestyles that naturally restore the planet. The purpose of industrial agriculture, in his view, is to create profit rather than food. In their single minded search for profits, corporations essentially declared war on soil in 1940. In sixty years they have destroyed 70% of the planet’s topsoil by deluging it with chemical fertilizers, pesticides and herbicides and killed off the wealth of microorganisms that make it fertile. Beginning his adult life as a lumberjack, he got fed up with destroying pristine forests to build homes for rich people and went to university to study and teach forest management. In 1972, it suddenly came to him that applying forest principles to food production would substantially increase yields, while simultaneously repairing the environmental destruction caused by 150 years of industrial capitalism. He coined the term permaculture in 1978. From 1981 on, he has devoted his life to helping people to design farms and gardens based on permaculture principles. Mollison has a special interest in urban permaculture, as it has the highest productive potential. By becoming self-sufficient in food production and water management (ie eliminating stormwater runoff and recycling gray water from showers, laundry etc and where possible, sewage water), cities offer the greatest potential energy and resource savings. By eliminating transport and packaging costs, locally grown food is automatically 95% cheaper. A strong believer in lawn liberation, Mollison has a special distaste for suburban lawns, which he considers a tremendous waste of water and energy. A food forest in the front yard uses 50% less water, is far less work and provides a continuous supply of healthy, chemical-free food. In the video below, a Denver woman has transformed her front lawn into a mini-food forest using permaculture design. According to Juliet Schor in The Overspent American, by 1995 were spending $7.6 billion annually on residential lawn care.